You may have heard of Curse – they’re that site you downloaded WoW mods from any time in the last decade and now a massive network of fansites, info hubs and other bits. 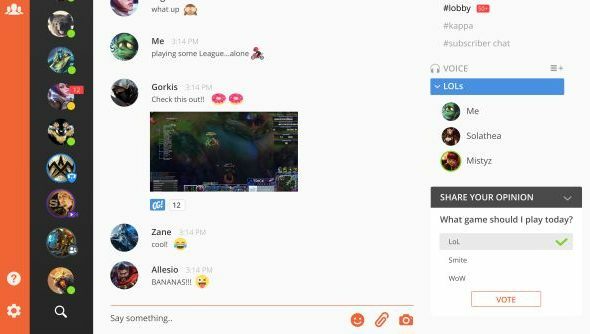 They’ve also got their own apps, including the Curse client for aforementioned WoW (and other game) mod support, as well as Curse Voice, which they’ve just relaunched as simply ‘Curse’ – a voice and text communication program specifically designed for gamers. Similar to Discord, it provides Skype-like one-on-ones, TeamSpeak-like group chats and IRC-like rooms. It also has integration with Twitch, YouTube and other content platforms to allow for easier managing of communities by those individuals. Maybe try it with one of the best MMORPG? Perhaps most useful is the number of different games supported by the overlay, which they promise won’t lower framerate no matter how much action is on screen and what you’re doing with it. Direct integration with Twitch and YouTube will be great for both the folks that run those channels and their fans. Mostly though I’m just happy Discord has some competition in the all-in-one area. I think it’s a great program, but more companies trying different things will always lead to better stuff for we consumers in the long run. Curse has come out of the gate with an absolute tonne of features and some very slick production values, plus enough cash behind them to make sure they can continue updating it for a long time. Loads more on it over at the official site. To give it a shot you can either download it or use the web interface. It’s also available on various mobile platforms.